Adjure´s diamond cut lights with skull lamp covers pierce through pitch black in style. - - Note: Skull no longer has red eyes, eye sockets are chrome. Use of high power bulbs is NOT recommended and will void warranty. Este kit incluye todo lo necesario para su instalación. Precio original:155.00€ Precio Oferta:55.00€ IVA y portes incluidos. Para comprar este artículo podéis mandarnos un email o contactar con nosotros a través del teléfono. Using a 55/60 watt H4 halogen bulb, these headlights project a strong white beam uniquely directed by a gemstone inspired reflector. This feature results in a focused fan of light, eliminating the dark center usually associated with the use of halogen bulbs. 4-1/2" passing lamps include 35 watt H3 bulbs. Since this headlight was designed for a motorcycle, not a car or a tractor, installation is simple and straight forward. No special bulbs required. DOT Approved. Precio original:155€ Precio Oferta:55€ IVA y portes incluidos. Precio original:57.50€ Precio Oferta:27.00€ IVA y portes incluidos. Activate up to 6 brake lights to flash automatically & then stay on with a single squeeze of your brakes. Does not harm the life of your lights. Note: Provides 3 seconds of decelerating flashing brake lights. Se puede montar en: Universal para 12V. Precio original:100.00€ Precio Oferta:35.00€ IVA y portes incluidos. Precio original:17.50€ Precio Oferta:10.00€ IVA y portes incluidos. A marvel of electronic wizardry, this module makes the single filament or single circuit turn signals on the rear of your bike function as running lights, turn signals, & brake lights. The module wires in beneath your seat & works with L.E.D. or Halogen Silver Bullets or other custom turn signals you have installed on your bike. The unit will work with stock turn signals as well but you will have to use red lenses or clear lenses with red bulbs. (Not included). Valido para: Todos los modelos de motos japonesas. Precio original:101.50€ Precio Oferta:40.00€ IVA y portes incluidos. Silver Bullets used in front applications can operate as running lights and turn signals on many models (Halogen Silver Bullets will require the Run-Turn- Controller, P/N 4865, sold separately). L.E.D. Silver Bullets The CAD-designed lenses enhance the already bright L.E.D. output to provide exceptional, jewel-like illumination. Amber L.E.D. Silver Bullets are dual circuit. They are easily wired in front applications to function both as running lights and turn-signals, just like stock lights! Note: The necessary Load Equalizer is included in each L.E.D. Silver Bullet kit. There is no need to purchase one separately. L.E.D. Kits have clear lenses; the color is emitted by the L.E.D. circuit board. Colored Lenses are available but do not change the color emitted. Although Silver Bullet lights are extremely bright and highly visible, they are not D.O.T. approved and not intended as a replacement for stock turn signals. Precio original:227.78€ Precio Oferta:80€ IVA y portes incluidos. Universal Mini Bullets can be used as marker lights or auxiliary turn signals. Their intensity greatly exceeds their small size. Each style, smooth or grooved, is available with red or amber L.E.D.s. The power lead exits the light through the center of the hollow 3/8"-16 x 5/8" mounting bolt; this provides a very sanitary installation. Load equalizer not included. - - Approximate size: 1-1/4" Diameter, 3" Length, 3/8" Stand-off. - - Can also be used with our Bullet Light Mounting Kit, P/N 2289. Precio original:112.55€ Precio Oferta:45€ IVA y portes incluidos. These powerful mini lights seamlessly fit on your fender struts creating a clean look. Each kit comes with clear lenses & a set of colored lenses that match the light output. Lenses provide a brighter glow over standard flat lenses. Precio original:102.55€ Precio Oferta:45€ IVA y portes incluidos. 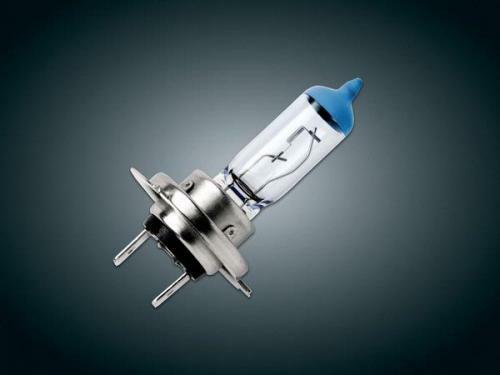 These 4000k bulbs provide 110 watts of performance from only a 55 watt bulb! This means less draw on your battery while still getting the brilliant white light you need. Precio original:69€ Precio Oferta:30€ IVA y portes incluidos. Let Cobra be your guiding light in the world of cruiser motorcycles. We have a wide array of spotlights, light bars, and lighting accessories for your motorcycle. All of Cobra´s light bars really shine and, best of all, bolt right on to the stock triple clamps without difficulty. Top-notch mounting hardware retains the original turn signals and ensures that the spotlights never appear to be an afterthought. Chrome- plated, snap-in visors are available separately. Precio original:340€ Precio Oferta:180.00€ IVA y portes incluidos. Precio original:331.45€ Precio Oferta:145.00€ IVA y portes incluidos. Precio original:331.45€ Precio Oferta:180.00€ IVA y portes incluidos.